Technical blog in English / Italian / Spanish about 9/11 attacks. The author - Enrico Manieri - Henry62 - is a forensic ballistic expert, a technical consultant of the Italian national broadcasting corporation. 1. To promote understanding of the facts about the terrorist attacks of 9/11 and to discourage relying on rumor and conjecture when searching for the "truth." 2. Because I believe that "Loose Change" is an influential introduction for many people to 9/11 conspiracy issues. 3. To encourage respect for the victims, living and dead, of the 9/11 attacks. My comments and analysis are mostly restricted to the issues raised by the video. At the end of this document are links to websites with in-depth analyses of 9/11 conspiracy theories, as well as links to the "official" version of events and to other analyses by experts and laymen." A 131 page written critique of the popular 9/11 conspiracy film, "9/11 Mysteries". Available in .pdf and .doc formats from the website. A collection of documentary videos about 9/11 and the 9/11 truth movement from mainstream media sources, debunking videos and truther/debunker debates. Mike J. Wilson: A short movie illustrating the final moments of American Airlines flight 77. Key points include lamp pole evidence, security cam view analysis, generator damage and actual photos. Witness new video and photos never seen before until just recently. "Whatever you believe about 9/11, the spreading of false claims helps no-one, and we’d like to play a small part in revealing some of them. We’re not about debunking entire conspiracies, then, but will use this site to zoom in on what we think are the more dubious stories, revealing the misquotes, the distortions, the inaccuracies that are so common online." An expose of Richard Gage and his 9/11 group Architects and Engineers for 9/11 Truth. This blog is interesting more for its "Topics" menu than for the blog itself, which is only occasionally updated. Private Message Debunk911Myths to find out how you can contribute to the wiki. Provides articles (Wikipedia-style), information and resources relating to the 9/11 attacks, along with addressing common myths and theories. For the undecided - a guide to common 9/11 theories. Compiled by JREF Forum Member Ref. This paper is written to demonstrate that those who believe that the World Trade Centre was destroyed by controlled demolition, rather than the impact of the planes, are mistaken. While I sympathise with the overall aims of protesting against US and UK foreign policy, I don't believe that US officials took part in a conspiracy to murder thousands of their fellow-citizens. I believe that the truth is in fact more alarming: US and UK foreign policy is based on ignorance, not malice. But I don't believe in fighting ignorance with ignorance. However well-intentioned, the demolition theories will not achieve their goals because they are based on an ignorance of good science. An astounding collection of links and original work representing the best of the best--a mountain of wheat culled from a sea of chaff, organized into an easy-to-navigate buffet of tasty debunking goodness. Implosionworld.com has received numerous inquiries from around the world requesting information and commentary relating to the terrorist attacks of September 11th, 2001, and specifically the felling of the World Trade Center towers. We have been contacted by media outlets, structural engineers, schoolteachers, conspiracy theorists and many others who are searching for answers and some “perspective” regarding these significant events that have evoked deep emotions and undoubtedly changed our world forever. The editors of implosionworld.com have created this page to answer a few of the most frequently asked questions that fall within our area of knowledge and expertise. But first we’d like to be clear in stating that any conversation relating to “implosions” and what causes structures to fail is undertaken with reverence and respect to those who perished as a result of this event. As many of our frequent web visitors are aware, Implosionworld.com’s offices are located close to New York City, and several of our employees were personally touched by this tragedy. Our thoughts and prayers remain with the families of those lost and injured, and our intent here is to help foster a constructive base of knowledge and understanding through education, while dispelling false rumors related to the attack. "Loose Change is a video that examines the attacks of September 11, written and narrated by Dylan Avery. Originally fiction, Avery decided to present it as a documentary after further research. The video received attention on the internet, and a second edition was produced which contained additional information but omitted some information from the first video. A recut of the second edition was later produced, with minor changes and corrections. This page will address issues presented in all of the videos, which are freely available online." "The collapse of the World Trade Center (WTC) towers on September 11, 2001, was as sudden as it was dramatic; the complete destruction of such massive buildings shocked nearly everyone. Immediately afterward and even today, there is widespread speculation that the buildings were structurally deficient, that the steel columns melted, or that the fire suppression equipment failed to operate. In order to separate the fact from the fiction, we have attempted to quantify various details of the collapse." A step-by-step critique of Loose Change. 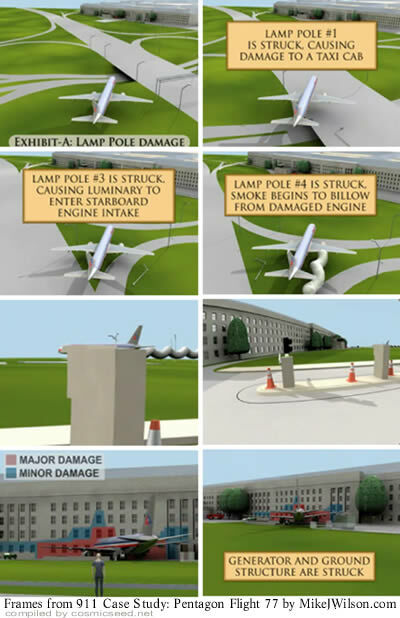 NIST's site dedicated to the WTC collapse investigations. Includes all final and draft reports made available to the public. Although this site has been out for a while, it does look like it was updated late last year. There are several pages dealing with the physics behind the claims, including the really whacky ones such as "dustification". PM examines the evidence and consults the experts to refute the most persistent conspiracy theories of September 11. Published in the March, 2005 issue. One month after the attack on the World Trade Center, M.I.T. structural engineers offer their take on how and why the towers came down. A critique of the documentary 9/11 Mysteries. Using the spirit and style of Screw Loose Change, Screw 9/11 Mysteries is an extensive debunking video ripping through the numerous faults and accusations of 9/11 Mysteries. A blog dedicated to exposing the lies, distortions and myths in the movie Loose Change. "There are likely a number of forums out there that serve as good forums to take a close look at the facts and actually discuss the issue, and I encourage you to visit those. What I offer here is an analysis of the events without any pointless mud-slinging or second-grade name-calling tactics." This site contains exhibits filed in the Moussaoui trial, for the news media. Others wishing to make these documents available on a mirror for the general public should contact gleslie [at] rcfp.org . Members of the news media should submit their email addresses to gleslie [at] rcfp.org if they would like to receive an email message when new items are available. Please include your media affiliation in the message. Please note that the "introduced" dates is incomplete for much of the evidence from Phase I of the trial, either because parties did not supply it or provided only a date the evidence was admitted. The Reporters Committee is managing this website on behalf of the news media as a public service, as called for in the Fourth Circuit decision in U.S. v. Moussaoui. If you'd like to know more about the Reporters Committee or contribute to defraying our costs for making the exhibits available, click here. Don't trust everything on Wikipedia, but a number of them are designated as featured articles, which means they have been screened for quality and are among the best on Wikipedia. WTC 7 and the Lies of the 9/11 "Truth Movement"
Mark Roberts' examination of the claims of the 9/11 Truth Movement. This junk is best filed under 'perplexing and idiotic'. Excellent website, upto date, informative and entertaining. e not addressed in detail on other sites. ansparency in 9/11 starts here. iots who think they are the 911Truth movement. olition in the history of America. deos that some may not recognize when they first watch them. t, ignorant, and totally wrong headed, 9/11 Moooooooovement. May they chew their conspiracy Cud forever, someplace else.